This page was created just for you. Drug Free Collier is here to empower, support, and encourage you to be the very best you! Almost half of Collier County middle & high school youth have never tried alcohol. More than 75% of Collier County youth have never tried marijuana. In the past 30 days, over 70% of our Collier County youth have not consumed alcohol. Over 80% of our Collier County youth have not used illicit drugs. Don’t believe the hype, not everyone’s doing it. The C.O.R.E. Society offers fellow students drug free alternatives and the support needed to maintain a healthy and safe lifestyle, with the hope that all students will be responsible, drug and alcohol free citizens. We encourage fun, healthy activities where you can be you! 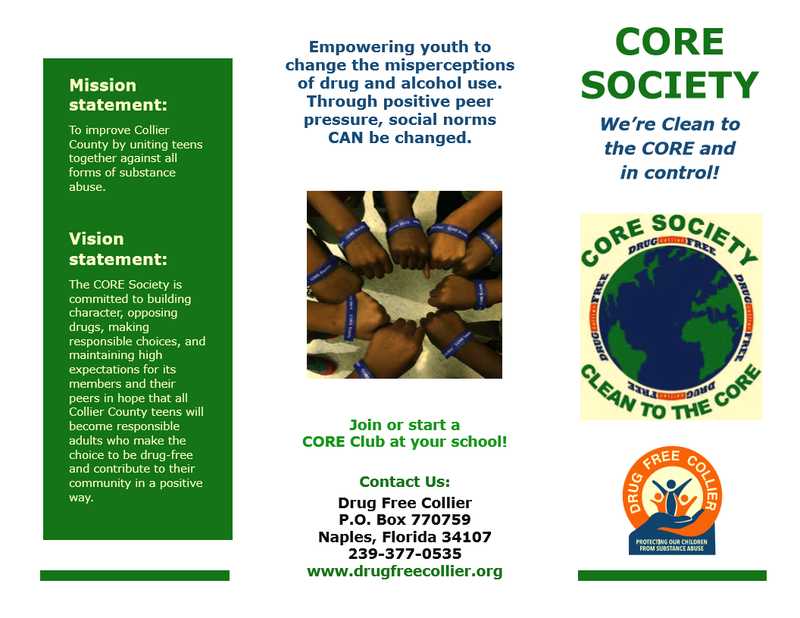 If you would like to join a CORE Society in your school, contact Drug Free Collier at info@drugfreecollier.org or 302-6717. CORE Societies have been established in the following schools: Naples High School, Lely High School , Palmetto Ridge High School, Barron Collier High School, Everglades City Schools,Lorenzo Walker Technical School, Gulfview Middle School, Golden Gate Middle School, Corkscrew Middle School, East Naples Middle School. Cypress Palm Middle School and Pine Ridge Middle School.